Did This New, Brighton-Born Bao Restaurant Blow Us Away? Last updated 31 October 2018 . By Katie Houghton. Light lychee cocktails pair well with kick offered in dishes. Bao is hot competition in London; and while there are plenty of restaurants now adding the heavenly bites of dough to their menu, there are fans that are inherently loyal to the likes of Mr Bao, On The Bab and Bao. Question is, how exactly can a new bao restaurant stand out when the title-holders are so celebrated? 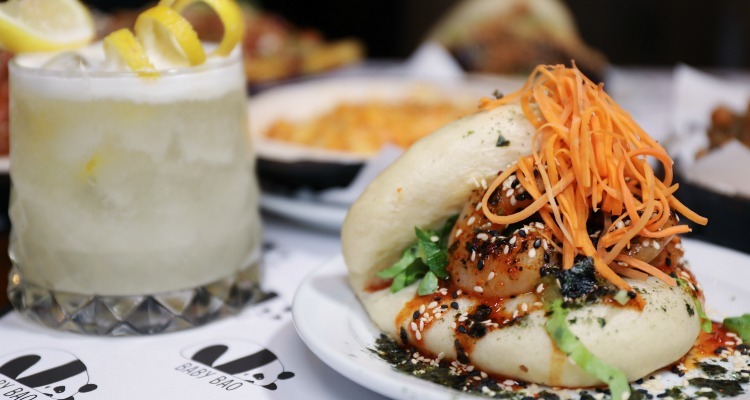 Notorious in Brighton, Baby Bao have headed to Haymarket to test their bao creations out on Taiwanese bun-loving Londoners in a space where pared back interiors and rich mahogany dining tables give the restaurant space a slinky cafe feel. I'm over-zealous in bao restaurants, I always order a little too much of everything, and that's made easy at Baby Bao. Opting for two buns instead of one (I was warned), hills, nay, mountains of bao were plonked on the table. I wasn't keen on the size, I think bao should be sweet and a little more accessible, but I had a nice time getting over familiar with their mushroom number (£5.50 thanks to a generous dose of miso mayo. The cod bao with nori and pickled fennel (£6) was a massive disappointment however. While the tartare sauce lacked depth, the tempura batter was wearisome and limp. Could the sides help Baby Bao out of a rut? Yes, they could. My husband and I were buzzing to try the following: sweetcorn and nori poppers, karaage caulifower marinated in soy and sesame oil, house chips with hoisin, and the gochujang mac and cheese with a 'spicy asian twist' (£5). While the mac and cheese was underwhelming and the house chips so drenched in hoisin that we had to leave half, it was the sweetcorn and nori poppers that saved the day thanks to their crunchy appeal and sturdy putting together, similarly replicated in the kaarage cauliflower. I wanted to fall hopelessly for Baby Bao and add a new restaurant to London's soon to be bulging bao repertoire; I wanted their pillowed bites to sweep me up and take me to a new world devoid of 'flossing'. The restaurant sadly didn't manage either. But what it did do? It proved that strong side dishes can be some the biggest contenders of them all. Baby Bao can be found at 66 Haymarket, St. James's, London SW1Y 4RW, just shy of Trafalgar Square.